Worldwide there are 15 species of cranes scattered across the globe. Most of these are found in the old world. Many are either threatened or endangered due to a variety of reasons with habitat loss being chief among them. Cranes are one of the oldest extant linages of birds arising as a group more than 60 million years ago. Their prehistoric presence in the United States is confirmed by 10 million year old fossilized remains from Nebraska. These ancient origins are evidenced not only by the way cranes look but also in their calls and flight. Sandhill cranes also have a long history in Arizona. Petroglyphs of these birds, etched into stones by native people hundreds of years ago, can still be found along the lower Gila River. They were found to be abundant by famed naturalist Elliot Coues along the lower Colorado in the 1860’s and accounts of nesting activity in the White Mountains and at Mormon Lake from the mid 1880’s were documented for these big birds. Greater sandhill cranes numbers declined through the late 1800’s and by 1900 cranes no longer nested in Arizona. Wintering birds still frequented the lower Gila and Colorado Rivers and portions of the San Pedro River though most of these would soon disappear too. By the early 1960’s the lower Colorado River wintering population of greater sandhill cranes had declined to only 210 birds and coupled with a small unknown number of birds wintering on the lower Gila River, represented only a fraction of the birds seen less than century ago. By the late 1960’s these populations begin to recover and these birds are now a common site on historic wintering grounds on both the Colorado and Gila Rivers. Sandhill cranes first started appearing in the Sulphur Springs Valley in the mid-1960’s and have continued to increase in both numbers and distribution. Cranes can now be encountered in Southeast Arizona in the San Simon Valley and along the Gila River from the New Mexico border to the vicinity of Fort Thomas in addition to the Sulphur Springs Valley. The Sandhill crane was described by Swedish zoologist Carl Linnaeus in 1758. The genus name, Grus, is Latin for crane and species name, canadensis, means from Canada. Two species of cranes are found in North America, the whooping and sandhill cranes. 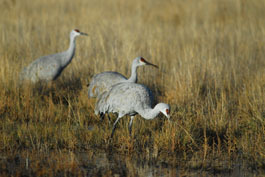 While the former is endangered, the latter is considered to be the most abundant species of crane on the planet today. There are five subspecies of sandhill cranes currently recognized by biologists, three of these winter in Arizona: greater sandhill crane (G. c. tabida), Canadian sandhill crane (G. c. rowani), lesser sandhill crane (G. c. canadensis). They look essentially identical but differ in size and measurements and to a lesser degree coloration. Cranes of all species sport long necks, beaks, and legs. Their tails are short and not visible when the wings are closed. The long tertiary feathers cover the tail when the wings are folded. Unlike herons and egrets, which they superficially resemble, cranes fly with the necks outstretched as opposed to folded against the back. Most crane species are sedately colored and are either predominately gray or white. A few species are adorned with vivid markings, but these are the exception. Sandhill cranes typically range from dark to light gray in color depending on the subspecies. Adult birds sport a fleshy red cap and white cheeks, and all ages have dark beaks and legs. It is common to see birds whose plumage is accented by stains of rusty brown caused by iron-rich mud used for preening. Some individuals stain themselves almost entirely brown, leaving only those unreachable portions (the upper neck and head) their natural color. Young sandhill cranes are brown on the top of the head and back and lack the red crown and white cheeks but are otherwise indistinguishable from adults by the time of migration though they may weigh slightly less. Of the subspecies of sandhill cranes that winter in Arizona the greater sandhill crane is the largest subspecies in the state weighing roughly from 11 to just over 14 pounds. Greater sandhill cranes tend to be lighter in coloration and may stand nearly 4 feet tall with neck stretched. The Canadian sandhill crane strongly resembles the greater in proportions and coloration. This subspecies generally weighs between 7 and 11 pounds. The lesser sandhill crane (G. c. canadensis) usually weighs between 5 ½ and 8 pounds and approaches 3 feet in height. It tends to be the darker than the preceding subspecies and has a proportionally much shorter beak. Sandhill cranes are long lived and have been documented surviving for 15 years in the wild. Captive specimens have lived in excess of 24 years. Sandhill cranes mate for life but quickly take another mate should theirs be lost. Some populations in the eastern United States and Cuba are non-migratory. However all western populations of sandhills migrate, often impressive distances. In general, the smaller the subspecies of sandhill crane, the farther they migrate between wintering and breeding grounds. Some lesser sandhill cranes banded on their southeastern Arizona wintering grounds flew to Siberia to nest. Canadian sandhill cranes, true to their name nest largely in Canada while greater sandhill cranes nest in Utah, Idaho Wyoming, Montana, and Colorado. Birds do not nest until they are 3-4 years of age. Nesting success of young birds is usually poor at first but increases with age. Elaborate courtship rituals entail calling in unison accompanied by leaps and struts by both sexes. Nests are constructed on the ground in open boggy meadows, marshes, or similar situations. Two eggs are laid and hatch after 30 days. Downy young are referred to as colts and reared by both parents. Mortality of young birds is high and seldom does even one of the young survive to make the fall migration. Young grow fast and by migration is nearly the same size as their parents. Migration to wintering grounds begins in September and birds start arriving in Arizona not long afterward. Birds wintering in eastern Arizona’s Gila River and Sulphur Springs Valleys are mostly lesser sandhill cranes, which comprise the majority of Arizona’s and North America’s crane population. They are joined by greater sandhill cranes from the Rocky Mountain States which also winter along the Gila River near Gila Bend and along the Colorado River north of Yuma. Migration is often made as a series of flights and many of our birds spend some time at Bosque Del Apache in New Mexico before continuing to Arizona. Sandhill cranes are exceedingly wary and do not allow close approach. They tend to shy away from areas of dense vegetation that may conceal predators. Cranes prefer to feed and roost in open areas where potential danger can be seen from a distance. Sandhills typically roost standing in shallow water but will also use sandbars in rivers or on open dry playas. They take flight after daylight and head more or less directly to their feeding areas. Sometimes smaller groups will stage in an area and then fly out in large flocks. After spending a few hours feeding they typically head back to their roosting area where they loaf for the remainder of the day. Occasionally cranes will fly out to feed in the afternoon an hour or so before dark, but this is an infrequent occurrence and they return to the roost before dark. It is not uncommon to hear cranes and after quite a bit of searching, to spot them wheeling as tiny specks thousands of feet in the air. Cranes often circle, riding the thermal currents high into the air, before heading to their various destinations. Greater sandhill cranes tend to fly a little later in the day and travel in smaller groups of two to five birds than do the smaller varieties. Wintering sandhill cranes often feed rely heavily on agricultural grain crops but may also frequent open desert, fallow fields. They are omnivorous but feed primarily upon vegetation as adults including agricultural grain crops. Corn is particularly favored and along with other grains is of particular importance during migration. Insects such as grasshoppers are also taken and make up roughly 7% of their diet. Cranes produce a variety of calls including creaks, trumpets, trills, and whistles which are audible for great distances. It is not uncommon to hear cranes long before seeing them. Calls are the product of a convoluted windpipe that twists its way, snake-like, through the bird’s sternum. Cranes are vocal through much of their daylight activity. Morning lift off from the roost is typically signaled by increased vocalization. Young of year birds make a single note whistle which if listened for, can usually be heard as flocks pass nearby. Cranes travel in flocks ranging in number from three to hundreds. Larger flocks form undulating ribbons when flying. Often cranes will wheel upwards in a spiraling fashion to great heights before leveling out and heading back to the roost or parts unknown. Each year, several thousands of sandhill cranes travel thousands of miles to spend their winter in southern Arizona. It is one of Arizona’s greatest wildlife spectacles. 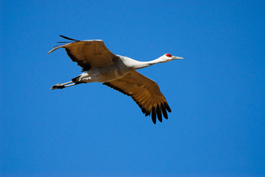 Some cranes come to Arizona from nesting grounds as far north as Siberia. Most of these birds winter in the Sulphur Springs Valley, but smaller numbers can be found along the Gila and Colorado rivers. Birds start arriving in October and leave in March for breeding ground to the north. Sandhill cranes are a traditional game bird and have a long hunting history in the United States. They are currently hunted in nearly every state they pass through on migration and have a reputation as fine table fare. Initiated by complaints of crop damage by farmers in the Sulphur Springs Valley, the Arizona Game and Fish Department instituted a limited hunt for these birds in 1981. Since then the number of permits and hunting area have been expanded to include portions of the eastern Gila River Valley near the New Mexico line. Hunts and harvest are closely monitored and hunters must possess a special permit which can only be had through a lottery. Less than 2% of Arizona’s wintering sandhill cranes are harvested each year. Despite these hunts sandhill crane numbers have continued to increase nationally. There is no hunting permitted for sandhill cranes wintering on the lower Gila and Colorado Rivers in Arizona. The best time to view sandhill cranes in Arizona is from November to the end of February. The farmlands of Cochise County’s Sulphur Springs Valley are one of the best places to view sandhill cranes where more than 20,000 cranes winter each year. The fields surrounding the Willcox Playa in the vicinity of Kansas Settlement or farther south near El Frida and McNeal are often particularly productive. Arizona Game and Fish Department’s Whitewater Draw Wildlife Area near McNeal is a roosting and loafing place for several thousand birds and is always a good bet for cranes and other wildlife. The wildlife area has viewing decks and trails where other migratory birds such as waterfowl, grassland sparrows, and various raptors may also be seen. In western Arizona along the Colorado River south of Ehrenberg many cranes winter at Cibola National Wildlife Refuge and may be seen while feeding in the fields along on the Goose Loop Drive. Remember that roosting and loafing area may be devoid of cranes when they are out feeding. They will typically return to these areas late morning.